Former Luton Town boss John Still has returned to manage former club Dagenham & Redbridge on an 18-month deal. The 65-year-old left Luton earlier this month after the 4-3 home defeat by Northampton Town, while Daggers sacked Wayne Burnett just days later. It will be Still’s third spell in charge at Victoria Road after leading them between 1992-1994 and then a lengthy tenure from 2004 to 2013, as they rose to the heights of League One. 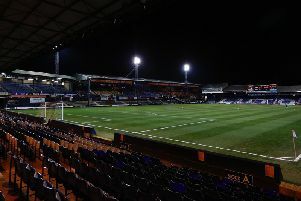 He left Dagenham to take over at Luton in February 2013, guiding the Hatters back into the Football League, before his departure two weeks ago. The east London club are struggling at the bottom of the table, although Still watching as they won 3-1 at Stevenage on Monday. The ex-Town chief added: “I’m delighted. The club has been important to me since I was 15 years old. I’ve spent a lot of time here as a supporter, player and manager. We’re in a difficult position so it’s really important we can try and do some things that can keep us in the Football League. “It doesn’t feel weird to be back here to be honest. There’s no real changes. I’ve come back and it’s like putting on an old pair of slippers, they just fitted back in really.